Manufactured from Rugged Hunters Hide Genuine Leather with Complementing Grey Satin Interior and Contrasting Hand Stitching. 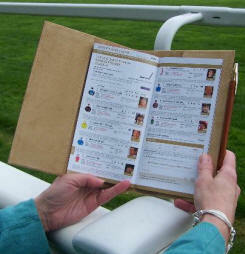 The Race Card Holder features internal pockets to hold betting slips and similar documents. We are so confident with your satisfaction with this product that we are pleased to offer a no quibble full money back refund for unused items returned within 7 days of purchase. Item guaranteed for one year from Date of Purchase. Shade of leather and stitching may vary slightly. 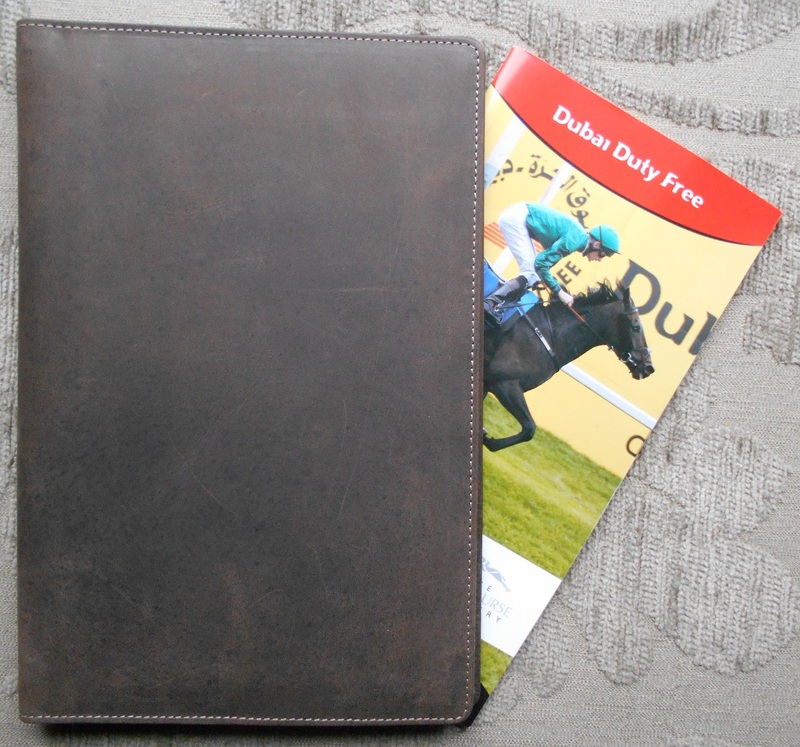 This item measures 165x250mm and is suitable for all UK Racecards including Jockey Club and Arena Leisure sizes, Ascot, Royal Ascot and A5 (210x150mm) sizes. Hand produced by English Craftsmen it is the ultimate 'to be seen with' racecourse fashion accessory. It will retain your race card in pristine condition as well as make heads turn! Manufactured from high quality bridle tan leather, finished with a complementing luxury suede pig skin interior it is finished to an extremely high standard with beautiful contrasting hand stitching. 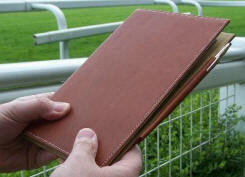 The race card holder features internal pockets to hold betting slips etc and a useful, external, integral pen holder. We are so confident with your satisfaction in this product that we are pleased to offer a no quibble full money back refund for unused items returned within 7 days of purchase. Item guaranteed for one year from date of purchase. The race card holder would make a wonderful special gift. Pen and racecard not included. We would recommend a Cross Slimline Ballpoint to accompany this product. This item measures 160x230mm and is suitable for Royal Ascot Sized, A5 (210x150mm) and 1/3rd A4 (210x108mm) Sized Racecards. Will not currently accept Jockey Club and Arena Leisure Racecourses' sized cards.